Visitors to Birmingham city centre are being offered the chance to travel back through time and enjoy a festive history lesson when this year’s Christmas Parade takes place on Saturday, 8 November. Organised by Birmingham City Council, the parade will start at 5.30pm, leaving Colmore Row as the Christmas lights are switched on in the city. The theme of this year’s parade is ‘Christmas through the Ages’, with a number of floats representing different Christmas celebrations throughout history. The first float will represent the first Christmas, with a traditional nativity scene complete with Mary, Joseph and the baby Jesus, closely followed by the three wise men riding camels. Highlights of the parade will also include a sumptuous medieval banquet, a fire-eating jester and a yule log which will be dragged through the city. The sponsor of this year’s Christmas Markets is Birmingham-based Willmott Dixon, which will use its float to bring to life the Charles Dickens classic, A Christmas Carol, complete with the ghosts of Christmas past, present and future. 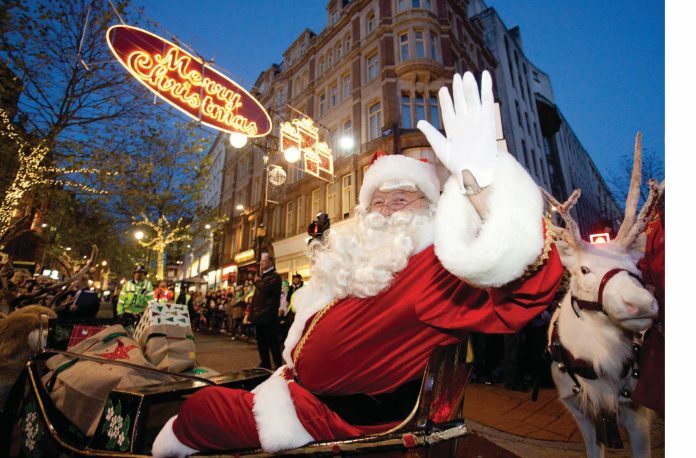 Father Christmas will arrive in a spectacular illuminated carriage, sponsored by Retail Birmingham, in support of the Christmas Grotto at House of Fraser and the Help Harry Help Others charity. Other characters at the parade will include snowmen, angels and stilt-walking Christmas trees, through to roller-skating puddings, baubles and Christmas crackers, who will also mingle among the crowds after the parade. Bringing up the rear of the parade will be Father Christmas and his trusted reindeer, accompanied by the Lord Mayor and Lady Mayoress of Birmingham, who will be riding in an illuminated horse-drawn sleigh. The Lord Mayor said: “The Christmas Parade and lights switch-on is always a real highlight of Birmingham’s calendar and this year’s event looks set to be every bit as spectacular. The parade route, which is approximately a mile in length, will take in Colmore Row, Temple Row West, Temple Row, Bull Street, High Street, New Street and then back through Victoria Square. Traffic restrictions will be in place in those areas from 5pm to 7.30pm to ensure a safe and successful event.